Home health care and private duty care can help you maintain your independence in a familiar space. You can hire a home health or private duty care aide for as little as three hours a week. We all want to hold on to our independence for as long as possible. But what if you need help caring for yourself and you're not ready to move to an assisted living facility? The answer for many people is to have someone come to the home and provide that care. "We always make an effort to keep people in their homes when it's appropriate. It's less expensive, provides more freedom, and keeps people from being exposed to infections in institutional settings," says Dr. Eric Weil, director of the program that manages high-risk Medicare patients at Harvard-affiliated Massachusetts General Hospital. The options for home care are private duty care and home health care. They have two different purposes. 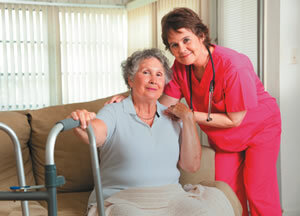 Home health care is a temporary service that brings nurses and therapists into your home to provide treatment. It's intended for people who are recovering from illness, injury, or surgery, with the goal of helping you get better and regain your independence. For example, a physical therapist can visit if you've had a stroke or joint replacement surgery, or a nurse can come to help with wound care. The professional who visits will provide only a specific skilled service, and won't cook, perform light housework, or shop for you. Home health care is covered by Medicare, but you'll have to meet certain eligibility requirements: a doctor must certify that you need the service, and also that you are homebound—unable to get to an appointment on your own; a doctor must review your home health care plan regularly; and the home health agency must be Medicare-certified. You can still qualify for home health care if you attend adult day care or if you have a caregiver who lives with you. Private duty care provides the day-to-day help most people need to remain in their homes. Care is available for a few hours or up to 24 hours per day. But private duty care workers usually fall into two categories: licensed or registered. Both are able to offer homemaker services, such as housework, cooking, shopping, overseeing medication routines, and transportation. The difference is that a licensed worker, such as a home health aide, will also be trained in body mechanics and able to provide hands-on physical care such as help bathing, eating, brushing teeth, and using the bathroom. Medicare does not pay for private duty care, but some long-term care insurance policies do. Costs range from $15 to $25 per hour, and most agencies require at least three hours per week. When choosing a private duty service, think twice before working with an independent contractor or a registry that simply acts as an employment agency that matches workers with clients for a fee. In both cases, you'll be the only one supervising the caregiver, and you'll pay the worker directly. You will also be responsible for all payroll taxes and Social Security withholding. who will be coming into the home—a team or just one person. Dr. Weil says it's also important to have a caregiver who's a good communicator. "Make sure the person or company has a reasonable understanding of basic health issues, and is comfortable reaching out to your health professionals if you need additional care."? Ask the doctor: Can exercising ward off Alzheimer's disease or dementia? Successful aging: Who stays healthy?